There was great anticipation when The Smithsonian National Museum of African American History and Culture officially opened its doors a year ago. The nation looked on as the 99-year old daughter of a slave rang the opening bell, while the first African-American president and First Lady, Barack and Michelle Obama, stood at her side. This historic visual was a moment for many to finally recognize the important value of history and its permanence and resonance to the present. 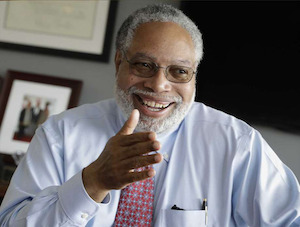 Dr. Lonnie Bunch is the director of The Smithsonian National Museum of African American History and Culture. Located on the National Mall in the nation’s capital, the NMAAHC encapsulates the powerful narrative of African-Americans and their significant journey to and within the United States. Appropriately known as “A People’s Journey: A Nation’s Story”, NMAAHC takes up 400,000 square feet and has seven levels. In its first year, the museum has set new records for the average length of visits, which is four to six hours, and has the largest number of museum charter members. As the 19th member of the Smithsonian Institution, the NMAAHC has attracted more than 2.1 million visitors and has 36,000 artifacts, where only 10 percent are currently on display, said Dr. Leslie Fenwick, dean emerita and professor of the Howard University School of Education. Fenwick is also a member of the NMAAHC Scholarly Advisory Committee, founded by the late historian, Dr. John Hope Franklin. The museum’s exhibits tell many stories of African-American history, with much focus on education. Shedding light on African-American history in academia reveals how the founding of historically Black colleges and universities initiated great change, including solutions to freedom, even as Blacks fought against a socially oppressive agenda. “You can’t tell the story of the African-American experience without talking about HBCUs,” said Bunch in an interview with Diverse. The connection between the NMAAHC and the HBCU community is shared through the continuity of the struggles of HBCUs and their contributions to historic events, as well as, artifacts that schools have donated or loaned to the museum. Spreading the story of HBCUs throughout the museum is to ensure that visitors understand the history, importance and continuing resonance of these institutions, said Bunch. The relationship between the NMAAHC and HBCUs also extends to the acquisition of pieces from HBCUs. Historically and presently, African-American artists have viewed historically Black colleges as homes and centers of appreciation for their work. Hampton University, Florida A&M University, Southern University, Spelman College and Clark-Atlanta University, are among many HBCUs that have the work of African-American artists on display and within their archives. Many of the exhibited pieces within the NMAAHC art gallery are the finished products of HBCU graduates and faculty members, said Swygert. The museum has work from Aaron Douglas, the founder of Fisk University’s Art department, as well as, David Driskell, a Howard University alumnus, who taught at both Howard and Fisk. Looking to the future, Bunch said the NMAAHC will continue to build upon the relationships, excitement and the trust that the museum has ignited over the past year. “We will continue to do educational programs to service schools, both locally and nationally,” said Bunch. “We’ll continue to do public programs that will run the gamut, programs that celebrate cultural creativity—music and the arts—to programs that will wrestle with the challenge of the confederate statues, for example,” he said.